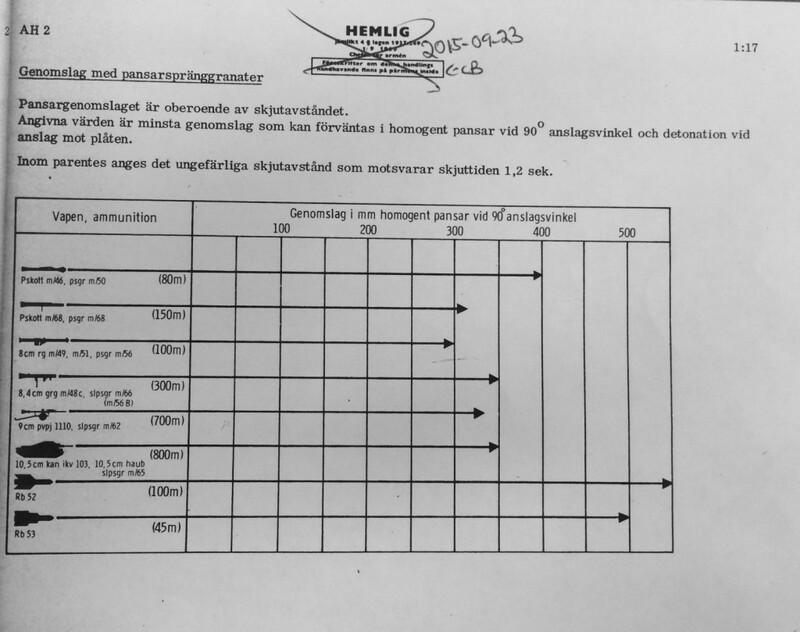 After literally years of searching for an official Swedish penetration table of all anti-tank weapons in one place, a casual mention in the gunnery field manual finally set me on the right track. The official table is contained in a publication called “Arméhandbok del 2” (Army handbook or Army field manual, part 2), where I’ve never thought to look before. Part 1 contains tables of organization and equipment and is mostly unclassified, but part 2 is classified, is not listed in the national archives library catalog and does not have an unclassified table of contents – that’s why it took me so long to find it. The national archives copy is from 1970, so I got the relevant pages declassified without any problems. 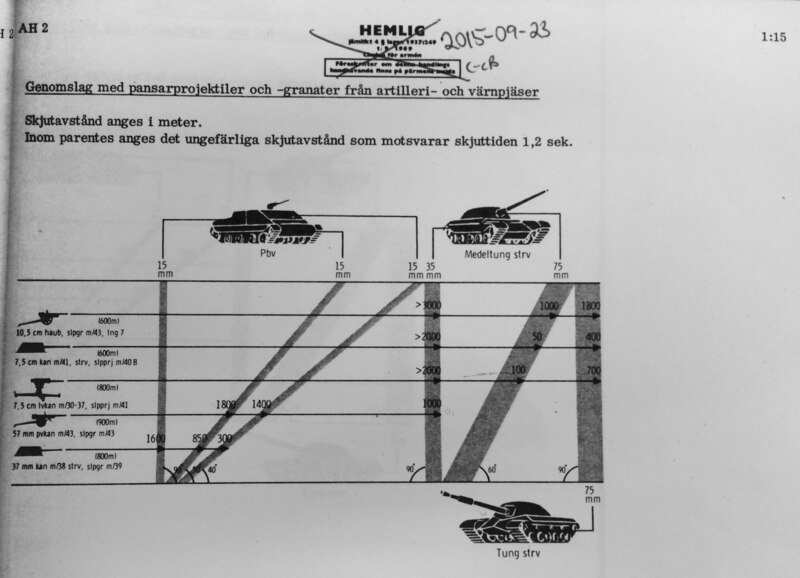 The penetration figures are shown in the form of diagrams that show the typical maximum distance at which the given weapon and round can be expected to be effective against a fictive “threat tank” (most likely based on estimates of Soviet equipment), when hitting it in one of four places: hull front, turret front, hull side and turret side. There are three such “threat tanks”. First, a medium tank (medeltung strv), which corresponds decently (but far from perfectly) to the real T-55A and T-62A, at least frontally. The real T-55A and T-62A have 100mm front plate sloped at 30° from the horizontal (not 120mm @ 38° – close enough, though), and the hull and turret sides are at least twice as thick in reality. Second, a heavy tank (tung strv), which is probably intended to represent the T-10 – I don’t think it matches very well, though. Lastly, an APC (pbv), which just has 15 mm of armor all around. 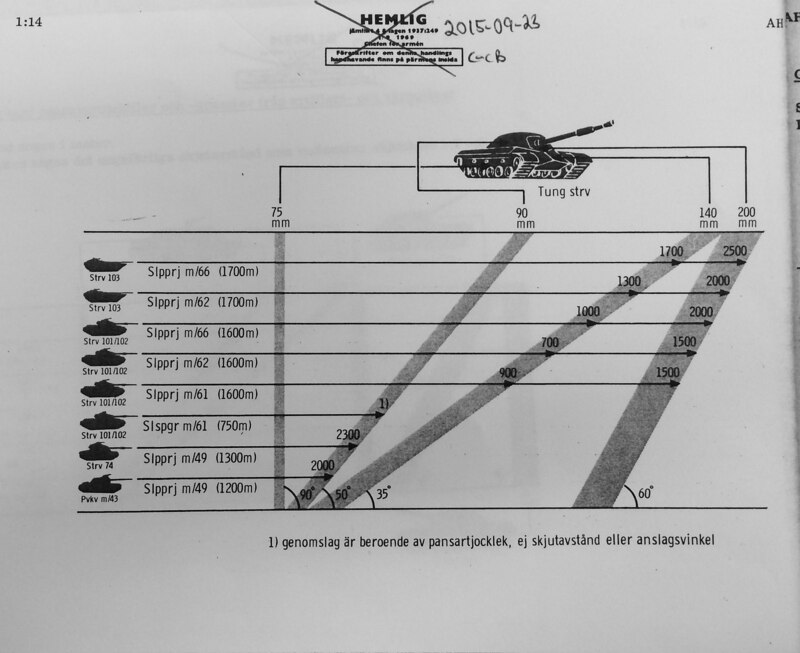 For all diagrams except the HEAT one the grey bars in the diagram symbolize the armor plates on different parts of the enemy tank, their slope and relative thickness. At the bottom of the diagram, next to each “armor plate”, the angle from the horizontal plane for that plate is given, so the impact angle from the geometric normal of the plate is the complementary angle (90 minus the given angle) to the given one. At the top of the diagram is the thickness of the armor plate, and a guiding line that shows where on the tank it’s located. From left to right, the armor plates shown are: hull side, turret side, hull front, turret front. The leftmost column show the firing tank, the round used, and (in parentheses) the the typical distance equivalent to a round flight time of 1.2 seconds. The arrows extending from the gun show the maximum distance (in meters) at which the given armor plate can be penetrated with the given gun and round. 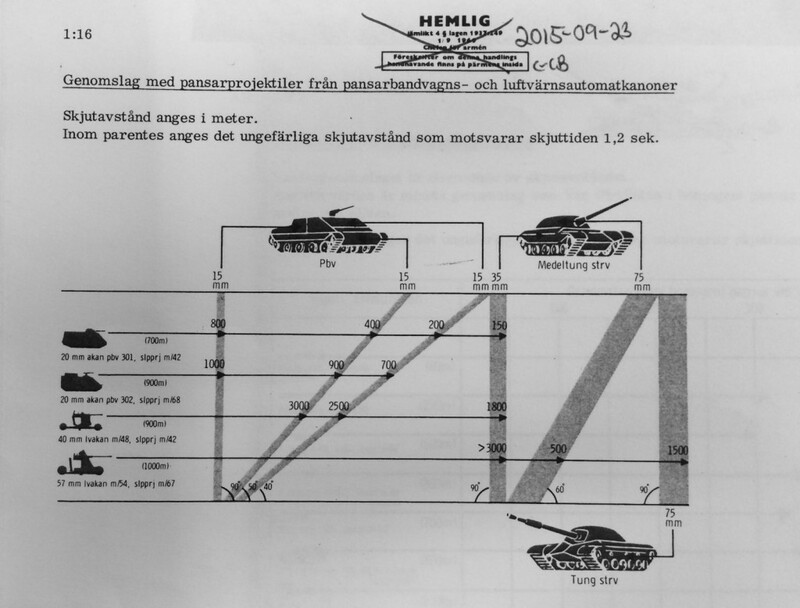 These two diagrams show the performance of tank (and TD) guns. Strv 101/102 is the Centurion with the 10,5 cm L7 gun; the Strv 103 has the same gun but with a longer barrel. Both Strv 74 and Pvkv m/43 both have 7,5 cm Bofors guns that can fire the same rounds, but the latter’s gun is slightly shorter. Slpprj m/66: Swedish designation for the British L52A1 APDS. 61 mm penetrator. Slpprj m/61: Swedish designation for the British L28 APDS. 60 mm penetrator. 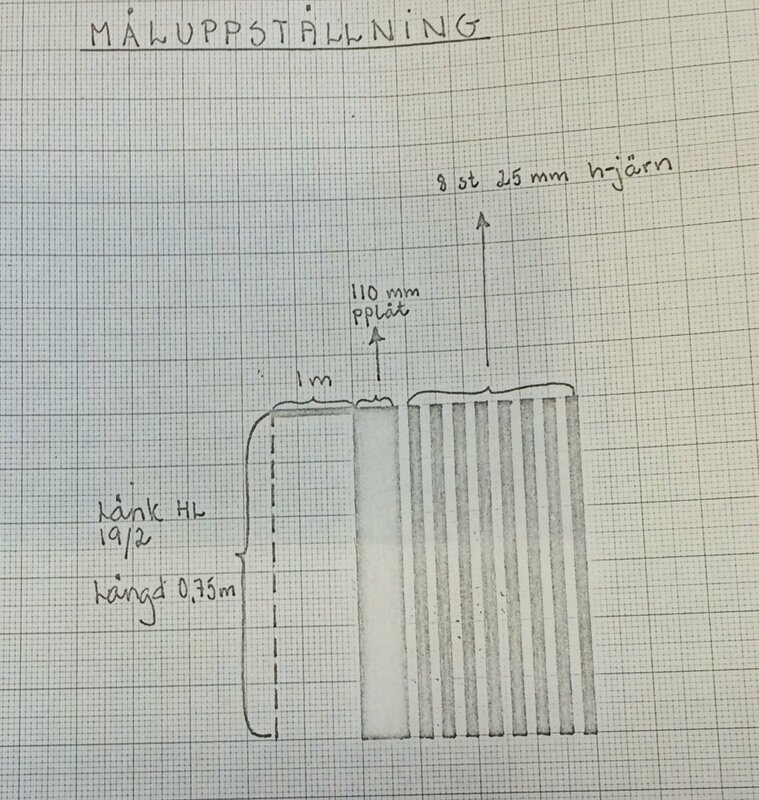 Slpprj m/62: a Swedish-developed APDS round. 57 mm penetrator. Mainly intended to secure a domestic supply of ammunition and with the hope of getting a round superior to the British one. After developing it, the army got into an argument with the Brits about licensing fees and patents for it (the Brits claimed it was based on their design). Slspgr m/61: a British HESH round. The footnote says “penetration does not depend on range or angle”. This round was rarely used in Sweden; the army thought it was prohibitively expensive compared to regular HE rounds. Slpprj m/49: a Swedish APDS round. 10,5 cm haub m/40: a Bofors-made howitzer, firing a WW2 vintage APHE round. 7,5 cm kan m/41 strv: the gun for the Strv m/42, firing its original WW2 AP round. By this time, this gun was only in service as a fixed fortification. 7,5 cm lvkan m/30-37: a Bofors AA gun, firing a WW2 AP round. 57 mm pvkan m/43: a Bofors towed AT gun, firing a WW2 APHE round. 37 mm kan m/38 strv: the gun used on all the Swedish WW2 light tanks, such as the strv m/38, m/39, m/40 and m/41, firing a WW2 APHE round. 20 mm akan pbv 301: a 20 mm Bofors autocannon, firing a WW2 AP round. The gun was surplus, taken from decommissioned Saab 21 strike aircraft. 20 mm akan pbv 302: a 20 mm Hispano-Suiza autocannon, originally mounted on the Saab 29 Tunnan aircraft. 40 mm lvakan m/48: the famous 40 mm Bofors gun, L/70, firing a WW2 AP round. 57 mm lvakan m/54: a Bofors 57 mm AA autocannon, big brother to the 40 mm L/70. Did not last very long and was retired long before the 40mm. Pskott m/46: a Swedish copy of the Panzerfaust, but with a new warhead. Pskott m/68: also known as the Miniman; a disposable recoilless launcher. 8 cm rg m/49 and 8 cm rg m/51: a multi-use RPG-like recoilless rifle, firing a mid-50’s HEAT round. Rg stands for raketgevär. 8,4 cm grg m/48: the famous Carl Gustav recoilless rifle, firing a mid-60’s HEAT round. 9 cm pvpj 1110: a 9 cm recoilless rifle with a very long barrel, firing an early 60’s HEAT round. Commonly found towed or mounted to a Volvo jeep, but could also be pulled on a sled behind a skiing troop. 10,5 cm kan ikv 103: the gun on the ikv 103, firing a mid-60’s HEAT round. Also included here are various 10,5 cm howitzers that could fire the same round. Rb 52: the Swedish designation for the French SS-11 ATGM. Rb 53: a Bofors-designed ATGM, also known as Bantam. From left to right, chain links, one meter of air, 110 mm armor plate, then eight layers of 25 mm “commercial iron” plates (probably equivalent to mild steel). The chain links were 113 mm long and 62 mm wide with a diameter of 19 mm. The chains were spaced at 100 mm intervals. 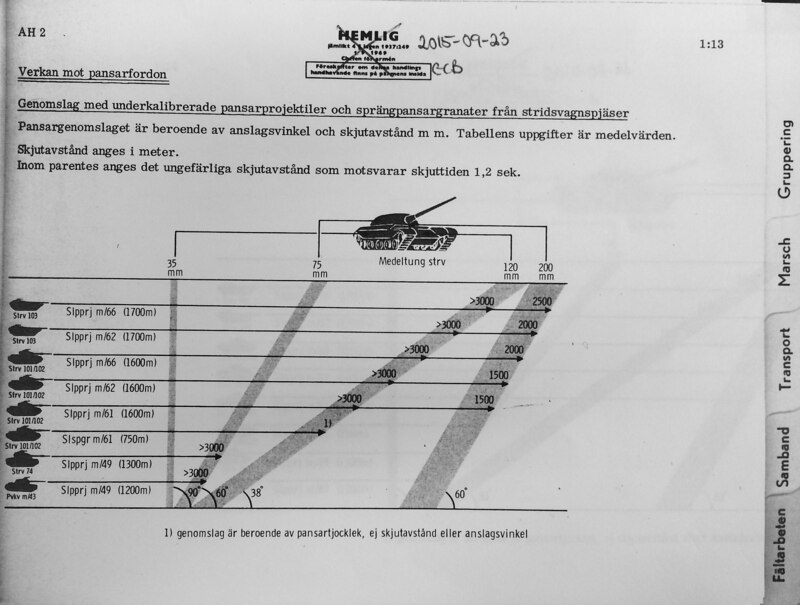 A summary of the report states that on average, for 9 cm HEAT rounds (pansarvärnspjäs 1110), the penetration was about 40% of what it should be at the same standoff distance, while for 8,4 cm HEAT rounds (8,4 cm granatgevär m/48, aka “Carl Gustav”) the penetration was about 75% of the expected. A translation of the results follows below; for images see read the PDF version (in Swedish). This is a rare (on this blog) report in English, from the Aberdeen Proving Grounds in Maryland, USA, titled Protection provided by steel and aluminum armor against fragments from high-explosive ammunition (U). To aid potential Googlers in finding it, I’ll list some identifying numbers. The report seems to have ended up in a Swedish archive via official channels; it appears to have been forwarded via the Swedish military attache in Washington DC. Some appendices are missing, presumably removed by the DoD before the report was handed over to foreign hands. This memo (dated 1946-12-03) discusses a new and interesting ammunition technology, namely projectiles with a core of a brittle but very hard metal, such as tungsten carbide. In order to keep the high speed of the projectile, various technologies (such as conical guns and sub-caliber saboted rounds) are possible. The author recommends contracting Bofors to develop such ammunition for trials with the 75 mm pvkan m/43, and that some in-house trials with the 37 mm pvkan should also be conducted.